A few episodes ago on Menage A Tarot, we talked about Tarot in media and pop culture, and different places we’d seen Tarot in movies, TV and such. Props to the BBC mini-series “Jonathan Strange and Mr. Norrel”. It’s fun and interesting….sort of Harry Potter for adults-ish with a whiff of history to it, sort of. 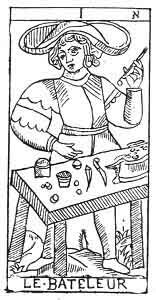 But in any case, there is a scene between Childermas and Vinculus (long story) where Childermas (the magician Mr. Norrel’s seeming assistant/apprentice) whips out his “cards du Marseille” to tell Vinculus’ fortune. Had a major “I TOLD YOU SO” moment when Childrmas implied the cards were trustworthy because “drew them myself”…just like in #PeaceTarot ! I plan on catching up the rest on demand, hopefully soon or at the very least pick up the novel by Suzanna Clark that inspired the series. Bravo BBC for a fun and entertaining show…and a lovely mention of Tarot.